“Squid fishing is currently dead!” These words chilling to anyone in the squid fishing industry, were stated by Mark Rowe, MD of Balobi Fishing at Port St Francis today, 12 March 2014. Rowe made the comments in the light of dozens of fishing boats lying idle at the harbour in St Francis Bay for the past three weeks. He was commenting on the 50-odd striking fishermen at the port today, the second day of the strike. Some of the striking fishermen at the St Francis Bay harbour today. They are striking for increased wages. 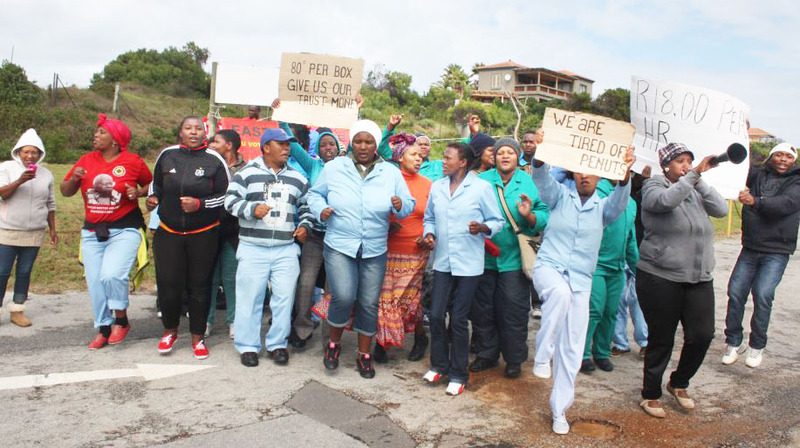 The offer, the Fawu officials say, was made at a meeting last week.” The officials also say they will be striking for another week unless things are resolved. In his version of events, Rowe says that in the meeting Fawu on behalf of the fisherman, asked for R24 per hour across the board. The increases being demanded range from 20-100%. “Our offer is a 7% increase,” Rowe says, adding that this was a 5% increase after Balobi’s initial offer of 6.5%. He also said the fishermen want 80 cents a box commission. “We are paying 65 cents a box commission. 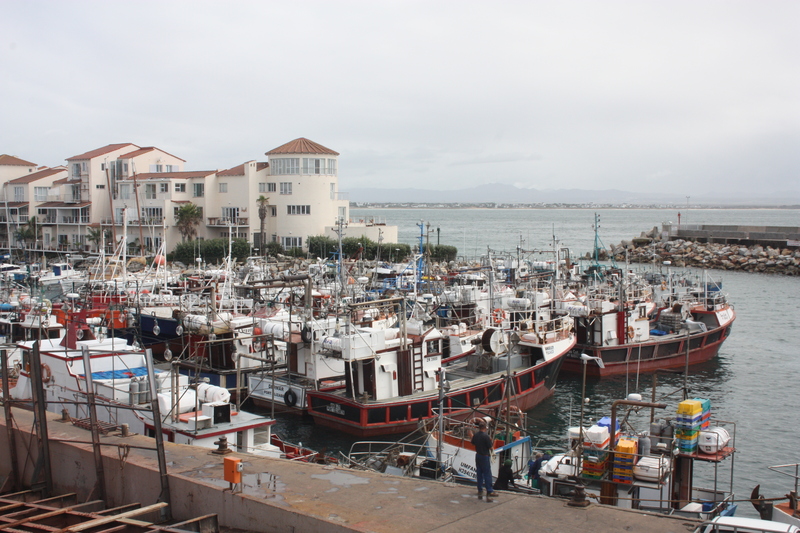 Fishing boats lying idle at the harbour in St Francis Bay as there are no squid to catch off shore of St Francis. He alluded to all the boats in the harbour. He says there are no fish to be caught and boats return after three days having caught nothing. When told that fishermen say they are being offered less than farm labourers, Rowe said Balobi fishermen’s wages range from the minimum of R12 an hour right up to the most senior posts (supervisors etc) who get R24 an hour. It was suggested to Rowe that there appeared to be poor communication between the two camps, but he did not agree this was the case. Owing to the severity of the fishing situation and low or no catches, Greg Christy of the South African Squid Management Industry Association last month advised that it was being mooted to have more ‘closed fishing’ periods in place to enable the squid to complete their breeding cycle (aka recruitment). Rowe also mentioned the need for extra ‘closed periods’ for recruitment. “There is a very dire situation fishing wise at the moment,” Rowe said. He added that the ‘red tide’ was partially to blame.